Please take note: We do not guarantee the exact type of US coin’s that will be in each bag. There may be a mix of different coins, or the bag may also be filled with only one denomination of coins. However each bag will contain a total of $1,000 face value and consist of only 90% silver. Now you can purchase a bag of 90 percent silver coins that have a face value of $1,000. Each of the bags that are ordered will come with various types of 90% US silver coins that are all dated 1964 or earlier. As most precious metal investors and collectors know, the United States Mint began to reduce the amount of silver that was used for production of circulated coins down from 90 percent to only 40 percent starting in 1965. Today, no coins are produced by the mint that have silver in them, which makes the 90 percent silver coins even more sought after. 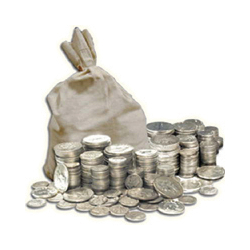 Each of the 90 percent bags of silver coins will include a mix of denominations, or a bag of the same denomination. The bag will be filled based on the inventory that is in stock at the time of purchase. 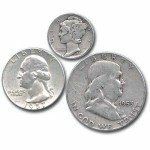 This means that you can likely expect to find either half dollars, quarters or dimes, all in varying degrees of conditions. Each of these coins are dated 1964 and prior. The bags contain a total of 715 troy ounces of pure silver. Since the silver coins are not produced any longer, these are considered relics of the era. Each of the 90 percent silver coins will be mailed with security and safety. 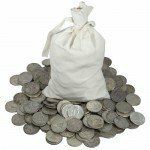 There is no question that these bags full of 90% US silver coins, will make a great addition to any fine silver collection. To learn more about our 90% silver coins, the ordering process or anything else you can reach our staff at 1-888-989-7223 or through email. You also have the option to speak with an agent online by way of live chat.